First you remove the leaves of the kohlrabi and put them aside. Then you peel them and cut two thick slices out of the middle part of each kohlrabi. Save the leftovers for later. Next you bring a lot of salted water to a boil and cook the kohlrabi slices according to their thickness for three to five minutes. After that just lay them on a clean kitchen towel to dry. Now you can peel and dice the potatoes. Put them in a pot with the peas and lots of water and bring everything to a boil. Then pour in some salt and cook until done. In the meantime you can bread the kohlrabi slices. Therefor beat the egg with lots of salt and pepper in a soup plate and fill another soup plate with breadcrumbs. Now you dip the kohlrabi schnitzel into the egg mixture, then the breadcrumbs, then the egg mixture again and finally the breadcrumbs again. Repeat until all kohlrabi slices are done. 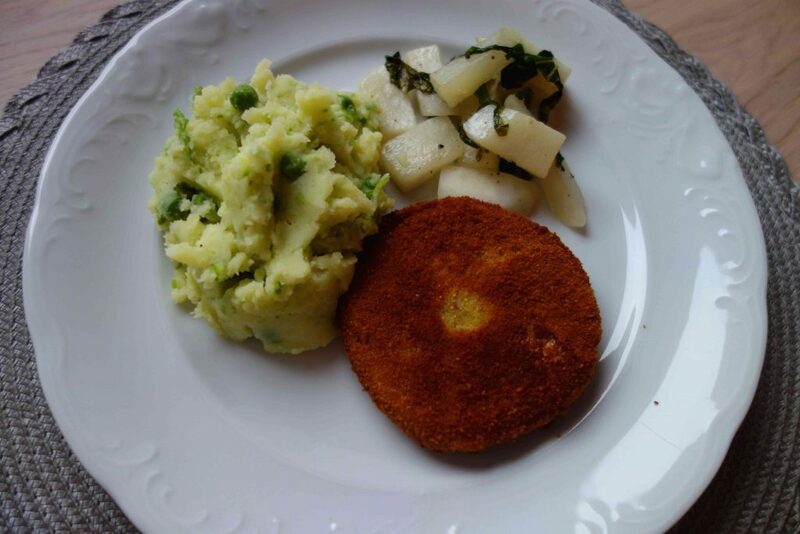 After that you fry the kohlrabi schnitzel in a big pan with lots of oil until golden brown and crispy on both sides. Meanwhile you can finish the mashed potatoes. Just roughly drain them- you want some cooking liquid to remain in the pot. Then add a piece of butter, salt and some freshly ground nutmeg to your veggies and roughly mash them.